In yet another example of one game developer ripping off another, Zynga’s been taking some heat for its launch of Dream Heights in the Canadian iOS App Store. 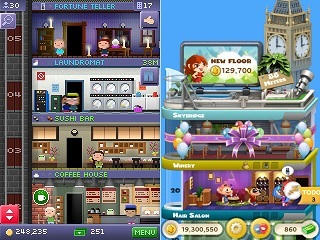 The game reportedly plays a lot like NimbleBit’s Tiny Tower, in which you erect a skyscraper floor-by-floor while managing the tenants and businesses within. The major difference appears to be cosmetic, with Zynga using its usual cartoon style instead of retro graphics. But wait, weren’t people just defending iPhone game ripoffs a couple weeks ago, when Atari got a BattleZone clone banished from the App Store? It looks like another example of the double standard that applies when it’s the big guy ripping off the poor, helpless indie. Only this case is a bit different. With Atari’s dispute over Vector Tanks, the similarities to Battlezone were mainly cosmetic. Vector Tanks’ developers used similar green wireframe tanks, font styles and sound effects, so that it could easily be confused with Battlezone at a glance. That was an issue of infringement on copyrighted images and sounds, which is easy to point out. Ripped off game mechanics are harder to judge. If I make a platform game where you run from left to right, collecting valuables and jumping on the heads of bad guys, for example, am I ripping off Super Mario Bros.? If so, Sonic the Hedgehog, Adventure Island and countless other classic platfomers are guilty. But because those games look different, feel different and have a few unique features of their own, no one accuses them of being shameless clones. Dream Heights does have some features that Tiny Tower doesn’t, including the ability to visit and shop at friends’ towers. It also looks a lot different. While those differences may not exonerate Zynga in the public eye, they’re examples of how the line can blur between ripoff and inspired variation. And like it or not, sometimes blurring the line is how the game is played. And aren't both a hack on Sim Tower? That was my very first thought on seeing the screenshots. To me looks like they both copied Little Computer People from the C64. And there were many, many platform games in the 80s long before that annoying plumber got into the act.